There are several orange to reddish species of Hydnellum in North America, but Hydnellum aurantiacum can be distinguished from the others on the basis of its whitish cap margin and young spines, its whitish to dull orangish (but not dark orange) flesh, and its prominently roughened cap surface, which looks like a relief map of mountains and valleys on Mars. 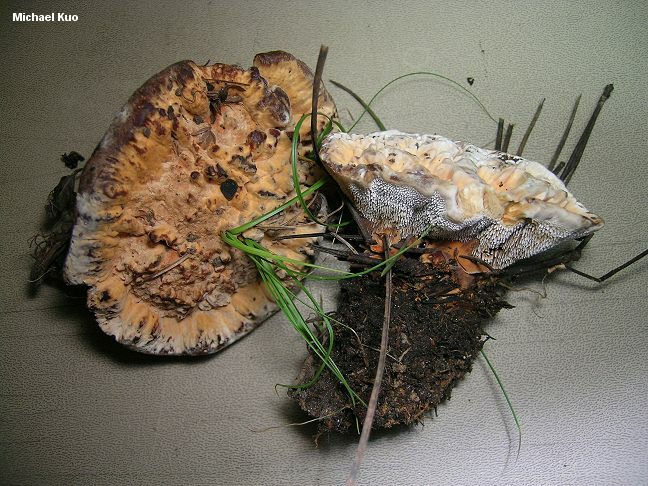 Hydnellum aurantiacum is apparently widespread in North America. While it is occasionally reported under hardwoods, it appears to prefer conifers--especially pines and, in the east, eastern hemlock. Several species are similar, but differ in the colors of their spines and cap margins; see Harrison & Grund, 1987 for help sorting out orangish species (but the key to Hydnellum in this paper is full of typos and errors, and the first couplet should lead to couplets 2 and 11, rather than 5 and 2) and, in the Pacific Northwest, see Hall & Stuntz (1972), who describe several varieties of Hydnellum aurantiacum. Ecology: Mycorrhizal with conifers (especially pines and eastern hemlock, and fir or Douglas-fir in the Pacific Northwest) and perhaps occasionally with hardwoods; growing alone or gregariously; summer and fall (or over winter in warm climates); widely distributed in North America. Cap: Usually single but occasionally fused with other caps; 3-10 cm wide; flat, becoming shallowly depressed; sometimes with aborted mini-caps developing on top of the main cap; pocked, pitted, ridged, or elaborately sculpted; orange to rusty red overall, with a whitish to dingy pinkish margin that often bruises brownish to blackish. Undersurface: Running down the stem or not; covered with crowded spines that are 2-5 mm long; whitish at first, becoming dingy. Stem: 2-5 cm long; 1-2 cm thick at apex; cylindric, club-shaped, or somewhat irregular; sometimes spongy near the base; orange to rusty red. Flesh: Two-layered, with a softer upper layer in the cap that is whitish to dull orangish--and in the stem and lower cap a corky, orangish-brownish lower layer that sometimes features zones of contrasting shades. Odor and Taste: Odor fragrant; taste somewhat unpleasant. Chemical Reactions: KOH on flesh greenish to brown or black. Microscopic Features: Spores 4.5-9 x 4-7 µ; subglobose or irregular; prominently tuberculate. Clamp connections absent.